Hello! I bought this city skyline die from MFT eons ago and never really used it. Like most paper crafters, I'm a hoarder and I have TONS of stamps that have never seen ink; die cuts, Cricut Cartridges, and embossing folders that have never been used; and paper that has sat, untouched for years. I could probably paper craft for the rest of my life and never buy anything again but glue and ink. So, just like I put myself on a 'Fabric Freeze' (yeah, I have way too much of that too), I have also put myself on a stamp, paper, and die cut freeze until I use everything at least once. I guess I won't be buying anything new for years. LOL! Well, while were on this subject, have you noticed that most of the new stamps are just repeats of older versions? I have seen so many new stamps lately that look just like so many retired SU! stamps I already own or look like another stamp from another company, but just different. It's kinda nice actually, because when a company comes out with a 'new' version of an old stamp I already own, I don't have to buy anything! I just get creative, updated ideas of how to use my 'old' stamps. It's wonderful when companies aren't creative enough to come up with new images we haven't seen before, isn't it? I know that was a naughty, sarcastic statement, sorry. LOL! But it's true! Anyway, onto my card. As usual, I kept it CAS yet still with enough detail to have a 'wow' impact. I cut the MFT city skyline twice: once in black and once in Crushed Curry, then glued them together and onto a Soft Sky card base. The clouds and banner were also cut with a MFT die. 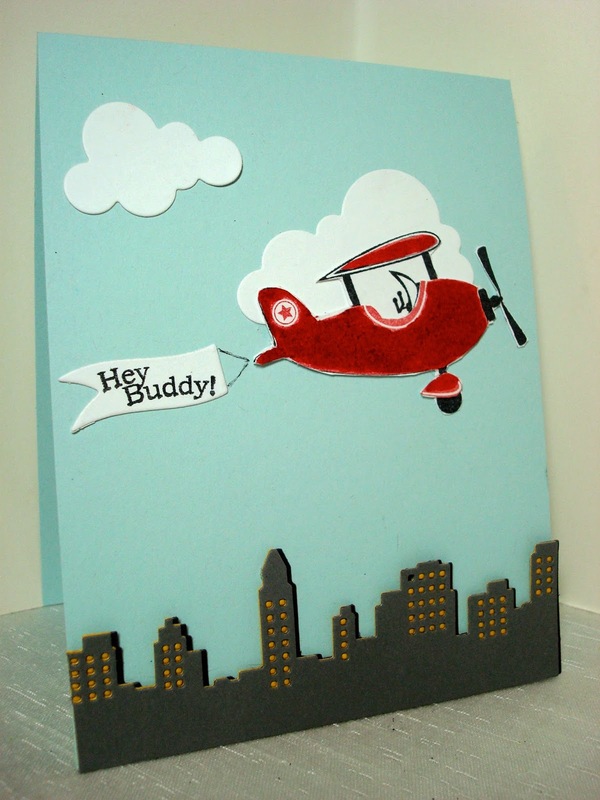 The plane is from a Papertrey Ink set and is also cut with a coordinating die. I hand drew the string to connect the banner to the plane. Oh this card is cuuuute ! Love the design ! fabulous idea for the banner ! Fabulous card Amy. Love the scene! And I agree with you, lots of repeat new stamps in the stampworld. I was just thinking the other day I think there might be too many stamp companies LOL. Terrific card, love the skyline! Thank you for leaving a comment. I love feedback from my readers. If you have a blog, I always return the love by visiting within a week whoever leaves a comment. I'm a lifestyle blogger who writes about fashion, travel, gardening, card-making, Bible Journaling, home decor, and much, more!